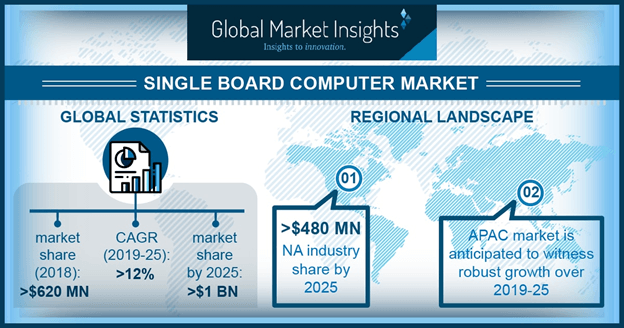 (SBC) Single Board Computer Market size is set to exceed USD 1 billion by 2025; according to a new research report by Global Market Insights, Inc. Growing adoption of advanced semiconductors in the medical sector is projected to create several growth opportunities for the single board computer (SBC) market over the coming years. Medical devices are increasingly being integrated with these systems to perform and monitor a range of processes. Features such as power, reliability, and versatility of these systems make them suitable for customized medical monitoring systems, medical electronic devices, and fault tolerant wearable computers, among others. For instance, Pantech solutions developed the IoT-based health monitoring system that is integrated with Arduino UNO SBC. It controls and processes the data that are detected by sensors. These systems can be used to measure BP, heartbeat, ECG, and SpO2. Companies are investing heavily in the development of new technologies, such as industrial robotics, machine automation, and IoT, to improve industrial and manufacturing performance. The processors in the SBC market are based on a unique architecture including ARM, Intel x86 or other custom architectures provide extremely high performance of upwards of 1.2 GHz clock frequency. The flourishing demand across consumer electronics industry is among the major trends in the single board computer market. The rising disposable income of consumers is creating a demand for intelligent and smart devices such as gaming consoles, smartphones, tablets, and other wearable devices. In addition, declining prices of these systems have resulted in a greater demand for these systems across the industry, fueling the SBC market. For instance, Raspberry Pi Zero systems are being used to develop new smartphones, such as ZeroPhone, which is a USD 50 Linux operated technology. The phone has several features, such as HDMI, Wi-Fi, full-size USB, 3.5 mm jack, 2G GSM connectivity, and GSM/Wi-Fi/microphone hardware switch option. It supports Raspberry Pi Zero, ESP8266, and Arduino systems. Product kits are available in different models and Raspberry Pi versions for providing advanced specifications to smartphones. These smartphones are being widely used for home automation & security, robot applications, SMS-controlled appliances, and baby & pet monitoring. The Arduino single board computer (SBC) market has applications in water treatment systems. It is designed to improve the water quality with the help of a monitoring technology. The programs for these systems are written in Java. Sensors are connected to the Arduino board that processes the information and send the output through external data transfer methods. These monitoring systems use the GPRS module for wireless data transfer. The information processed by the Arduino board is sent to the webpage through a GPRS module. This GPRS module updates the processed information on the webpage through the internet. The Arduino platform (ATMega-328) is implemented as a sensor node controller to acquire and process the sensor data. It is an affordable, open source platform that provides I/O pins for customizable applications and is augmenting the SBC market. The single board computer market is fueled by the adoption across the aerospace & defense sector and is projected to grow at a CAGR of 13%. The military sector is utilizing Raspberry Pi SBC in surveillance robots. Increasing automation is augmenting the demand in the (SBC) single board computer market. The surveillance robots are IoT-based systems that help the military & defense sector to secure the camp or border area using a manually controlled or autonomous vehicle with the internet connection. Multi-sensory devices detect the unusual border activities and these systems sends the wireless command to an authorized person, which then instructs the robot about further movements and activities. In addition, the integration of these systems in robotic vehicles using the SBC integrated cameras for live video streaming is further creating growth prospects for the single board computer market. Robots are integrated with Raspberry Pi 3 Model B, which is a third generation SBC model. It is a low-cost, powerful, and small-sized SBC that is being used in different robotic devices for military applications. Companies contributing toward the growth of the SBC market include Adlink Technology, Mercury Systems, American Portwell, Radisys Advantech, and MERCURY Systems, among others. These players are offering differentiated products in the market for various industry verticals to expand their customer base.